On August 25, the 55 meter long, 798 dwt offshore supply vessel Gulf Justice ran around in Port Mansfield, Texas. The vessel had been struck by Hurricane Harvey and was taking on water. The crew sent out a distress call requesting assistance. A tug was dispatched, but was not able to reach the offshore vessel due to the bad conditions and rough seas. 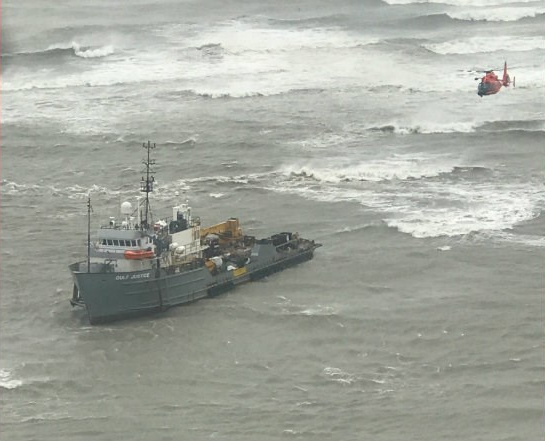 Two Coast Guard helicopters arrived on scene and hoisted all 12 crewmen off the Gulf Justice. No reports of injuries. The Gulf Justice was reported blown ashore and is now hard aground. The amount of damage was not yet reported and if any pollution was released.